After a week’s worth of speculation of the big announcement, Apple’s CEO Steve Jobs presented us with a ultra-portable notebook entitled the MacBook Air. We were on the show floor and had a chance to mess with the tiny laptop. We got a few pictures of the MacBook Air, its SuperDrive (aka CD/DVD reader+writer), and a few comparison shots with the Dell 15-inch m1530. 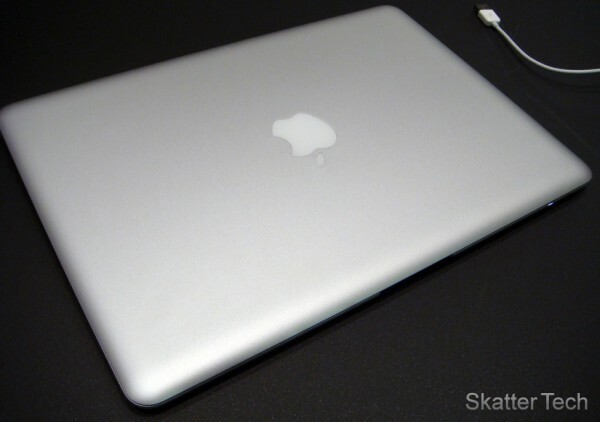 The first thing you’ll notice when you hold the MacBook Air is that it doesn’t have any easily visible ports. 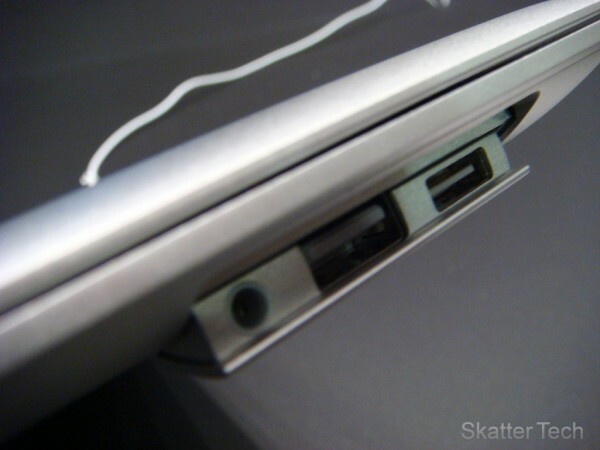 The device only has a MagSafe power cord connector on the left and a USB port, headphone jack, and a proprietary connector on the right. 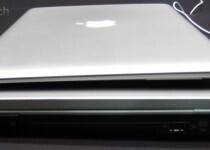 The notebook weights just 3 pounds since it even lacks a CD/DVD drive. Keep reading for more pictures and to find out what it offers. P.S. The price tag won’t be as exciting. The specifications look great, but the price is a bit ridiculous. Apple is going to charge $1,799 for the cheapest model, while the SSD configuration starts at $3,089. Although the tiny size of the notebook is the main reason for the high price, more powerful notebooks, which of course are a bit larger, from other manufacturers such as Dell are available for a fraction of the price. 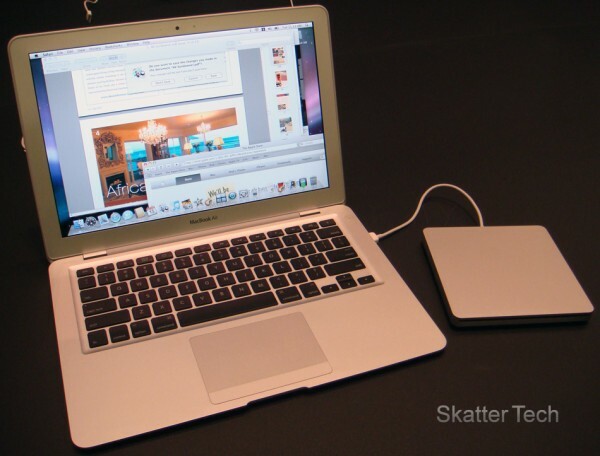 Portability is definitely something the MacBook Air offers, but there’s also other issues. For example you’ll need to carry adapters to connect the machine to a external display, there’s no microphone line in, and you’ll have to also carry an external DVD/CD burner. the worst part may just be the fact that the battery isn’t removable. Similar to iPods, the MacBook Air has a embedded battery. For a on-the-go laptop, Apple should have offered battery packs which anyone could just pop in when they run out of juice. 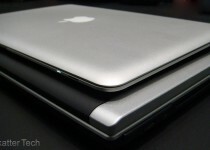 We took some comparison shots of the Apple MacBook Air versus the Dell’s 15-inch m1530. It isn’t exactly a great comparison in terms of specifications, but it does show how small this “ultra-portable” notebook is compared to a standard laptop on the market. Overall the notebook is great for those willing to spend the cash, but might be overdoing for average consumers. In my opinion most people wouldn’t mind carrying a slightly heavier load if they can save a few hundred bucks. The laptop seems strong, durable, and is designed quite neatly. The encasing doesn’t seem like it leaves any weak spots for anything to get damaged. The only ports on the side all tuck away neatly into the notebook creating a smooth rounded body. So what do you guys think? Anyone planning on buying one of these? Also if you guys have any further questions, please feel free to ask by replying in the comments! This may sound stupid, but the think that I like most about the Macbook Air, besides of course the size, is the keyboard, it looks nice and is also back lit. I would prefer something with a removable battery and quite a bit more horsepower. Quite easy on the eyes, great for travel, but are you kidding me on the price tag….. Need something more under the hood to justify that price, maybe ill have some interest when the tag goes down. If you think that the communication device you have is the best then you are yet to see this . Its great and amazing the features and functions are outstanding , it is better seen and than ANY . the New MacBook Air & New MacBook Pros is Apple’s newest 13.3″ ultra-thin notebook, World’s Thinnest Notebook, offering cutting edge design in a remarkably thin package. models now available with Intel’s newest generation of Core 2 Duo processors in 24-karat Gold colour plated case .